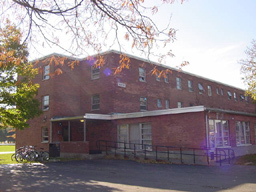 Warren houses approximately 100 upperclass students in double rooms. Each room has a private bath and is divided by a wardrobe into semi-private living areas. This privacy wall is not shown in the floor plans. The first floor of Warren has a well-equipped kitchen and lounge. A printer is located on the first floor. The printer room has an outside entrance and is accessible to all campus residents.